For anyone wanting to experiment with driving a stepper motor using an Arduino, you might want to try modifying the sketch below. You’ll probably need to modify the bit masks in directions() and enable() to get it running on any other model of Arduino than the Duemilanove (which uses an Atmega328P). * This enables the board to drive a single two-phase, four-wire stepper. * actual IC-to-digital line mapping for your particular board. // the bits set in directions(), below. // determine whether a current will flow through a given coil. // steppers at full-step increments. // these map to PORTB bits 4 and 5. // these map to PORTB bits 2 and 3, respectively. // This 700 microsecond delay gives time for current to rise sufficiently in each phase coil. // awkward than decrementing [n] and working backward through the cases below. // mirrors that going in the opposite direction. 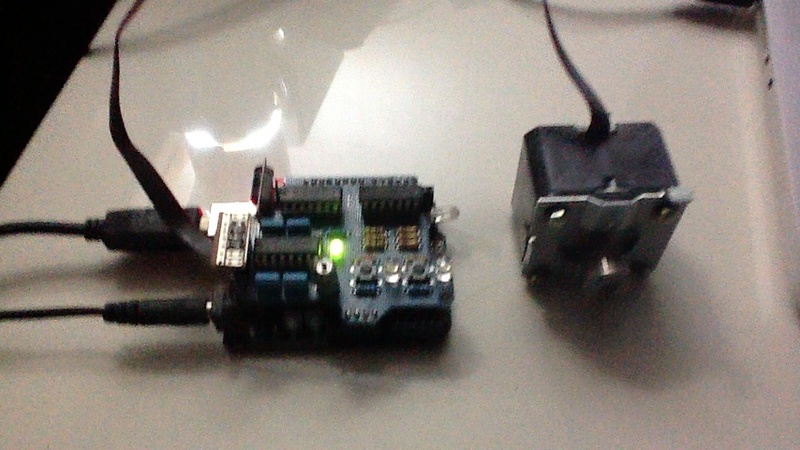 // Read both buttons on the board: Each button causes the motor to rotate in one or the other direction. // Notice that we don't use a delay at the end of this loop. // to ensure that coil currents have risen to a sufficient magnitude to overcome mechanical losses.